Debuggers are an interesting aspect of programming. They're supposed to help you finding and solving bugs. Without a doubt debuggers are one of the fields where developers of programming languages put a lot of effort in. It's a pity though that users may not always appreciate them. I strongly advise a dual monitor setup. Programming is a lot more fun if you have sufficient screen real estate :-) The experts may notice the continuous taskbar, which is visible on both monitors. You can either use MultiMon (free) or UltraMon (not free but better). Another nice tool is WinSplit for those that prefer a single large screen over a dual monitor setup, or use Windows 8. Type Integrated Check the help file for the other flavours and what they do. Warning Level Display With 4.30 several changes have deprecated certain functions. This alerts those rewriting / updating older code. Memorize positions on Remember where you've put the windows last time. Stop at program start off This would start your program and immediately stop execution. You could accomplish the same by putting a CallDebugger statement at the beginning of your source. Stop before end off This is the same as putting a CallDebugger as the last executed line of your program. Kill after an error off Allows you to immediately edit your code after an error. 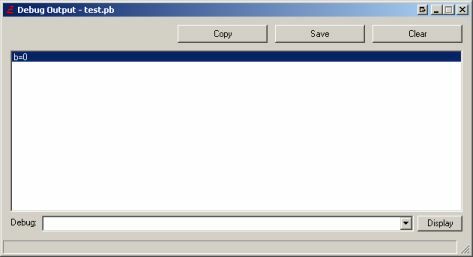 Unfortunately (with PureBasic 4.20) this means that all debugger windows will be closed as well. This is similar to pressing the 'skull' icon after an errror, which also closes all debugger windows. Keep error marks on Marks the error line. Start on According to the PureBasic developers the slow down this causes may be unnoticable. First of all, do not forget to turn the debugger on, either via Debugger / Use Debugger, or with the 'Use Debugger' button on the toolbar. When you're editing, you will see that the 'Kill Program' button on the toolbar stays grey. Once your program runs, it turns red and you can click on it to kill your program. The buttons directly left of it allow you to halt your program, step through it line by line, or continue normally. Select the appropriate debugger windows once your program has halted (that's not the same as ended!) you can open up any debugger window via the Debugger menu. By setting a (code) breakpoint by using [F9] on a specific line. 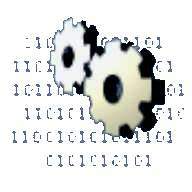 By setting a data breakpoint using Debugger / Data Breakpoints. By using the CallDebugger statement in your source code. Whenever the debugger encounters an error (such as divide by zero). By pressing the 'Stop' button on the toolbar whilst your program is running. An error is shown at the bottom of the PB IDE. Obviously the error would not be caught with the debugger disabled, and your program would crash. This will halt your program at that specific place in your code. You can then use all debugger features and windows, and go step by step through your code. The second method is simply pressing [F9] on any line in the editor. This would add a breakpoint to your code. You can clear these breakpoints by hitting [F9] again. Execution of your program will halt on the line with the breakpoint, just before executing the code on that line. When your program is halted you can use any of the open debugger windows, abort, continue running your program, or even step through your program, using the icons in the PB IDE button bar (Stop, Continue, Step, etc.). On every step, the debugger windows are updated. The third way is by adding a conditional breakpoint, in PureBasic called a 'Data Breakpoint'. Enter and run the code above. It will immediately stop at the first line with CallDebugger. Now go to Debugger / Data Breakpoints, and fill in the conditon a = 17 and hit the 'Add' button. This will tell the debugger to halt your code the moment the variable a reaches the value 17. In all these cases any debugger windows that are open (especially the Variable Viewer) will be updated the moment execution stops. Remember that you can define which debugger windows open when starting your code using File / Preferences / Debugger / Default Windows. You can also send messages to the Debug Output window using the Debug command. The Debug command has some quirks... more about that in the next section. [16:46:14] [ERROR] Division by zero forbidden. IncA() is only executed with the debugger ON. If the debugger is switched off, the line will not be executed at all. Do not confuse this one with the 'other' Variable Viewer which is accessible through the menu Tools / Variable Viewer. The debugger Variable Viewer window shows the values of all variables, arrays and linked lists in your program. The top section lists all variables that are in the 'root' of your program (ie. not declared inside a procedure) and those that are declared global (regardles if that has been done in- or outside a procedure). The bottom section lists all locally (within a procedure) declared variables which are non-global. The bottom section lists everything defined within a procedure, with the exception of the Global keyword. The top section lists the rest. On the top half you'll find a list of global variables, the bottom half shows the local variables. See the PureBasic help file for what the coloured icons mean. Note that the Variable Viewer is NOT real-time. It will only update on a breakpoint, or when stepping through your code with the debugger, or if you hit the 'Update' button. You can check that by running the code below. First run it. The first line with CallDebugger will switch to 'step' mode so you can step through your code line by line. Your code is now paused until you tell it to continue using the 'Step' button in the IDE (the first round button with a little arrow pointing right). Now bring up the Variable Viewer window via Debugger / Variable VIewer, then use the 'Step' button on the IDE toolbar to step through your code. Watch the value of your variable a change every time it passes the line a = a+1. Now hit the 'continue' button on the IDE's toolbar. Though your code is running, nothing seems to happen. If you hit the Update button you'll see how fast a has been increasing! If you want realtime updates use the Watch List. Now run this code, then click somewhere in your source code and then hover with your mouse pointer over the variable 'a'. Move the pointer away, then back over the variable a, and you can see how it increases. If you hover over the 'a' part of 'x\a' the IDE will show you the value of 'a', it doesn't recognize that the 'a' in this case is part of the structured variable x. Let the code run, but mark the part 'x\a' in the source code, and hover your mouse over the marked part, and the IDE will show you the value of x\a. Leave the code running, but now mark in line 8 the 'x.y' part, and hover the mouse over it. The IDE will then show all fields of the structured variable x, and their values. Don't forget to check out PureBasic's help-file! The Watch List window serves pretty much the same purpose as the Variable Viewer window, but it's realtime. First have the debugger open up the Variable Viewer and Watch List windows by default by going into File / Preferences / Debugger / Default Windows, then run the code below. You can add variables to the Watch List. Add the variable 'a' and the Watch List will show you the value of 'a' in real-time. The Variable Viewer will only update if you're in 'step' mode, or if you hit the Update button. A little trick to make it easier adding variables is to add a breakpoint [F9] to the line where your variable is first used or defined. Then, when the debugger halts on that line, you pick the proper variable in the Variable Viewer and add it to the Watch List. In 4.20 you couldn't watch strings in real time, but in 4.51 you can! The Memory Viewer allows a quick peek at an area in memory. Unfortunately it does not automatically update, and you're only allowed to monitor one specific area. It's probably best used in combination with breakpoints. It may often be faster to use a Debug statement and some code of your own making. ... and hit 'Display'. I tried @ and Len() and the regular +-/* and they were supported. The Profiler in 4.20 shows a graph with all lines in your code. Every time a line is executed, it increases a counter. You can easily spot what part of your code has been executed most. Note that this only counts the number of times a line has executed, it does not show how much TIME that line, section of code, or procedure, has taken. Use proper (sensible) variable names that mean something ten years later. Document your code. Document your code. Document your code. Keep things simple. Break expressions into smaller pieces. Stick to one statement per line. Learn your tools. Understand the means you have available, such as the Debug statement, and PureBasic's debugger, and how they could affect your program. Work your way up. Make sure all building blocks (procedures) work fine before you tackle the bigger things. Isolate and identify the problem. Do not assume anything. Continuously check for regression bugs. That last one deserves a little more attention. With a collection of routines that interact and depend on each other, each rewrite / improvement / bugfix may break something else elsewhere in your code. So what I've started doing is write a program that uses each and every procedure from my 'shared include', with different parameters and verifying the output. Every time I run into a bug I add another test to that test-program. With every new release of PureBasic, or every change in the 'shared include' I run my test program again, testing, testing, testing. And by doing so I uncovered a number of bugs that fixed my issues with CodeCaddy, but I also ran into (and fixed!) serveral bugs I was not even aware of, but which might have caused me serious problems in future versions of CodeCaddy, or in other projects.